(PhysOrg.com) -- To visible-light telescopes, this star-forming cloud appears to be chomping through the cosmos, earning it the nickname the "Pacman" nebula, like the famous Pac-Man video game that debuted in 1980. When viewed in infrared light by NASA's Wide-field Infrared Survey Explorer, or WISE, the Pacman takes on a new appearance. In place of its typical, triangle-shaped mouth is a new set of lower, sharp-looking teeth. The Pacman is located at the top of the picture, taking a bite in the direction of the upper left corner. The teeth are actually pillars where new stars may be forming. These structures were formed when radiation and winds from massive stars in a central cluster blew gas and dust away, leaving only the densest of material in the pillars. 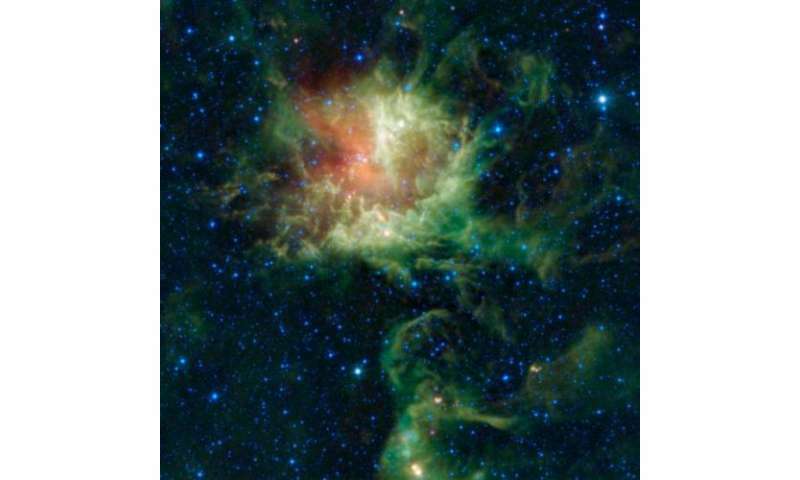 The red dots sprinkled throughout the picture are thought to be the youngest stars, still forming in cocoons of dust. The Pacman nebula, also called NGC 281, is located 9,200 light years away in the constellation Cassiopeia. This image was made from observations by all four infrared detectors aboard WISE. Blue and cyan (blue-green) represent infrared light at wavelengths of 3.4 and 4.6 microns, respectively, which is primarily from stars, the hottest objects pictured. Green and red represent light at 12 and 22 microns, respectively, which is primarily from warm dust (with the green dust being warmer than the red dust).